Your Pooch Will Drool Over! Give your hot pooch something to drool about with his very own homemade frozen dog treats and ice cream. Don't give him just plain old ice cubes anymore, shoot, you don't even have to share YOUR ice cream with him either, if you don't want to! Ok, maybe once in a while! Instead how about making him his very own frozen dog treats that you have kicked up a notch with things like fresh fruits, peanut butter or even chicken broth. What's that? You think I'm crazy. . .read on my friend. It's so fun to make frozen treats for your dogs! They are even a bigger hit with family and friends who come over for a bar-b-Que on those hot days and you pull out icy treats for all the dogs! People go nuts over them. . .and the dogs are pretty happy too! Humans aren’t the only ones who enjoy cold goodies on hot days. Yes, our dogs love those icy, frozen treats on hot days too. Whether they’ve been out playing Frisbee, doing a few laps around the pool or just napping under a shade tree, they love crunching on frozen treats of their very own. I love that old saying "I scream, you scream, we all scream for. . . . Dog Ice Cream!" Nevertheless, if your dog could talk I'm certain he would scream for an ice cold frozen treat. Here's a really yummy Ice Cream Recipe you might try Frozen Pumpkin Ice Cream. Baby! It's Hot Out Here! I bet you can remember when you were a kid, when it was scorching hot and that wonderful Ice Cream Truck would come jingling down your street. You would excitably run up and look at all your choices and finally pick one. Then off you would go to some shady spot or the porch and bask in the glorious feel and taste that ice cold Popsicle or ice cream cone made in your mouth. And if your were like so many of us, we would share our icy tasty treat with our best friend. . .our dog. Making your own frozen dog treats like Frozen Carob Chip Peanut Butter Cups or ice cream for your pooch is another great way to help keep your dog cool in the long hot summer months. And did I mention just how easy it is! Shoot there are all sorts of easy recipes for Homemade Frozen treats that use things like cut up fresh fruits and vegetables to whipping up a special little yummy frozen concoction. Look out ice cube tray. . . frozen dog treats are comin' your way! You might be saying, "but I always make sure to provide shade and plenty of fresh cool water for my dog on hot summer days, isn't that enough?" 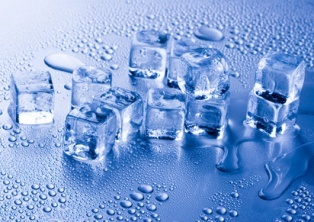 Might I suggest, that instead of giving your dog the same old fresh water or ice cubes as a treat, how about we kick it up a notch! Why not really surprise your dog with his very own chilly dog treats or ice cream! 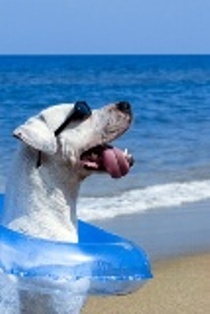 Don't forget to have your homemade frozen dog treats ready for your next bar-b-Que, swim party or dog party. 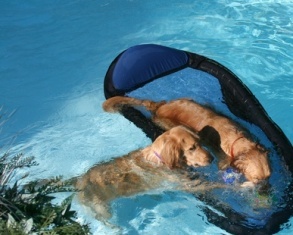 Maybe you could throw a "Dog Swim Party" with all the decorations! Whip up a batch of frozen treats and freeze them in coordinating mini cupcake liners. . .
. . .Hey! there are people out there who throw parties just for their four legged friends ya know!! You can even make meaty tasting frozen dog treats. 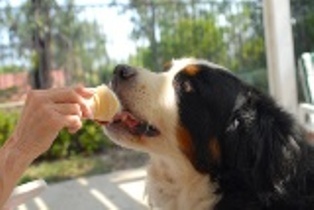 Make sure to take a look at our meaty ice cream recipe for dogs. Yeah I know, it sounds kinda yucky to us, but the dogs love em! Ice cube trays are fast and easy for this type of treat. Ok, so off to making all those yummy homemade frozen dog treats and ice cream! 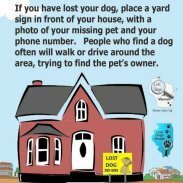 Your dog is waiting. . .